This work uses a comparative framework to address the adaptive evolutionary relationship between nesting ecology and the morphological diversification of the soldier caste in turtle ants (Cephalotes). Turtle ant colonies nest in pre-existing arboreal cavities, and soldiers specialize in colony defense by blocking cavity entrances with their armored heads. Analyses were focused on three major axes of soldier morphological diversification: discrete morphotype, head size, and head-size range (i.e., soldier polymorphism). The analyses showed that while all species use some entrances small enough to fit the head of one soldier, specialization on entrances that tightly fit the head of one soldier was only seen in species with the most specialized soldier morphotype. They also showed that the degree of soldier polymorphism was only positively correlated with the typical range of entrances in species with the most specialized morphotype. Overall, these findings indicated that a tight 1:1 size-matching between available soldier head sizes and selected entrance sizes is limited to species with the most specialized soldier morphotype, while species with less specialized morphotypes use a broader range of larger entrances. 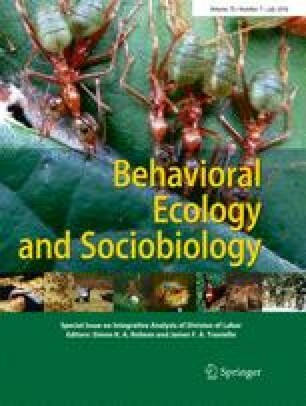 Together, these findings suggest a new general hypothesis for the adaptive diversification of caste systems: major shifts in ecological specialization drive the evolution of novel caste morphotypes, while minor expansions and contractions of an existing resource range shape the evolution of the size distribution of an existing caste. Broadly, these findings highlight the possibility for complex coupling and decoupling between different axes of caste diversification in lineages with complex social phenotypes. One key way in which complex "organismal societies" have diversified in form and function is via the evolution of morphologically distinct "castes" that specialize on particular social roles. Nevertheless, how ecological interactions shape caste diversification within social lineages remains poorly understood. Using a comparative framework, this work addresses how nesting ecology has shaped the diversification of an elaborate soldier caste in the turtle ants. The evolution of more specialized soldier types was associated with substantial shifts in nest-entrance specialization, while in species with the most specialized soldier type, there was also a match between head sizes and entrance sizes within and across species. These findings suggest the general hypothesis that the evolution of novel caste types is driven by major shifts in ecological specialization, while the size distribution of existing castes tracks minor shifts in resource use. This work is indebted to the taxonomic work on the genus Cephalotes by many authors, and especially the most recent, synthetic treatment of the group by M. L. de Andrade and C. Baroni Urbani. I thank Kleber Del Claro, Heraldo Vasconcelos, and Corrie Moreau for help with fieldwork logistics. I also thank the editor and two anonymous reviewers for valuable comments on an earlier version of the manuscript. This work was supported by NSF grant DEB 0842144, an 1851 Research Fellowship from the Royal Commission for the Exhibition of 1851, and research funds from the George Washington University.